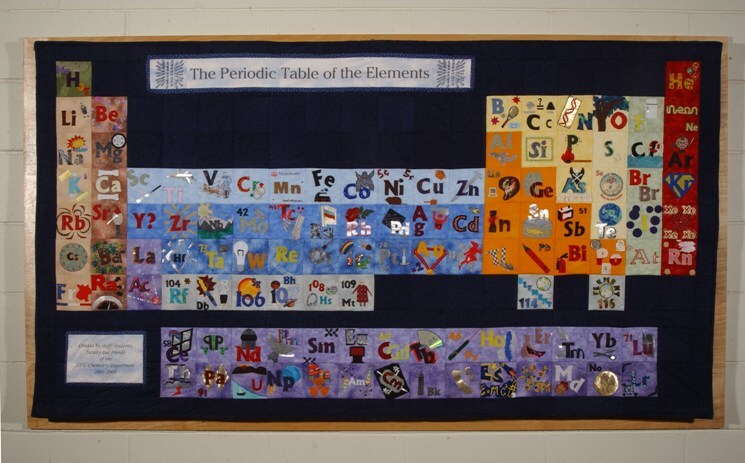 A group of quilters in the chemistry department thought it would be a good idea to make a quilt of the periodic table. It was to be group project and involve everyone, even those that couldn’t sew with the hopes that a sense of community would emerge.The leaders of the project were Marcy Tracey (Chemistry NMR technician ) and Shirley Black (Chemistry Lab Instructor). They determined what fabrics to use and cut the required blocks for each element.A simple method of cut and paste using a product known as Wonder Under was used for the letters and numbers and in a lot of cases for any pictures as well. A standard set of numbers and letters were used by everyone to give the quilt some continutity, other than that, there were no restrictions on what could be done with the block.Some chose to do a piece of art while others wanted a design that reflected the use of the element.This whole process took a lot longer than anyone anticipated, but eventually all of the blocks were collected. There were still some missing so the steering committee went to work to complete any missing blocks.Shirley Black took on the task of sewing the quilt together. This is a wonderful little project and thanks for letting me know about it. With 2011 being the international year of Chemistry, there is no better time to showcase one of the fundamental aspects of chemistry – the periodic table and I enjoyed seeing some of the interpretations of the elements you have come up with – it’s a welcome contrast to us chemists who think primarily in terms of atomic weights, electron configurations and other bizarre and esoteric terms which seem baffling to the layman. If you are interested in a little more information on the elements, let me recommend a book, The Disappearing Spoon by Sam Kean which was published recently and provides anecdotes, historical tales and other fascinating nuggets of information on the various elements but at the same time, is easily accessible to the non-chemist. But congratulations on your undertaking of a wonderful project and I look forward to seeing the finished product. I’m also looking forward to seeing iron since all my research over the past 15 years has focussed on this element in some form or the other. Dept of Chemistry, Concordia College.